✻ T u m b l e d S T O N E S ✻ CHRYSOCOLLA / AJOITE / SHATTUCKITE. 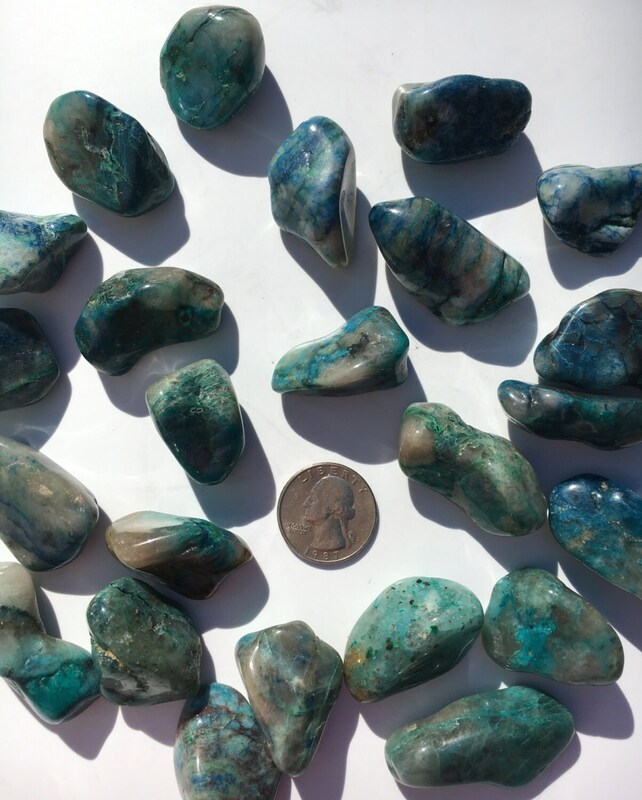 Chrysocolla/Ajoite/Shattuckite Protects against electromagnetic smog. Brings profound peace, centering with oneself. Overcomes stress-related illness. In karmic healing, it frees the soul. Helps meditation and communication. Draws out negativity. Encourages one to speak their highest knowledge. Enables one to remain open spiritually, no matter how negative the environment or thoughts that surround you. C h a k r a s: 4th (Heart), 5th (Throat), 6th (Third Eye). O r i g i n: Congo.